Echinacea draws a variety of insects. Its latest appreciator is this pretty Silver-spotted Skipper (Epargyreus clarus), a familiar and common butterfly in this area. The name misrepresents its spot color, which is white not silver. 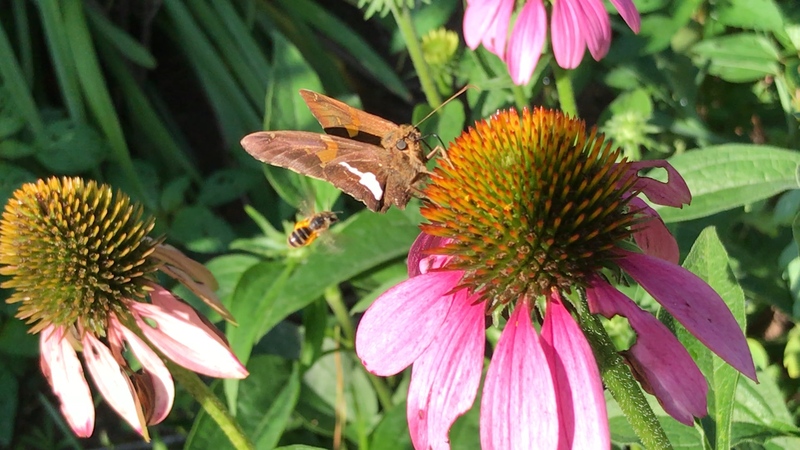 For a moment a honeybee vied with the skipper for this flower, but it soon left amicably and settled on the coneflower in back. The bee bounces in at 7 seconds into this video. We could use some rain, a lot of rain actually. Hope your garden is making you happy. 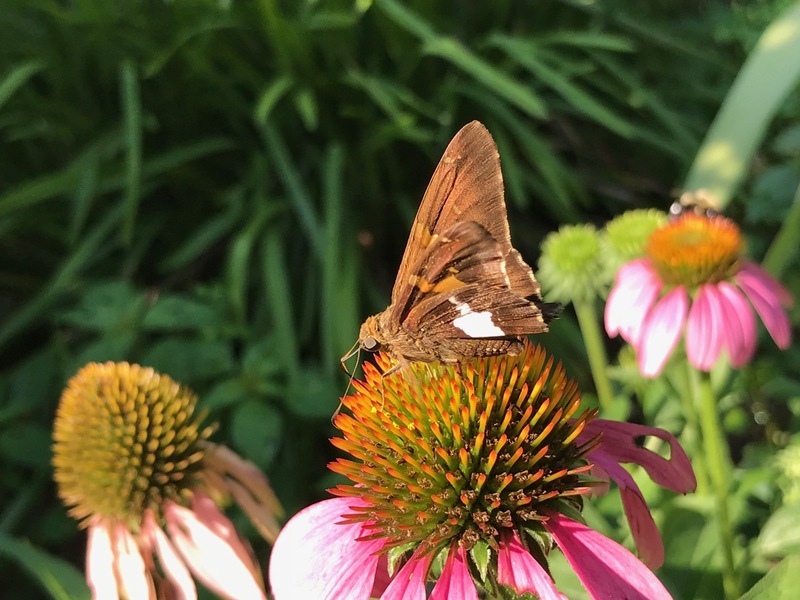 This entry was posted in garden and tagged Echinacea purpurea (Purple Coneflower), honeybee, Silver-spotted Skipper (Epargyreus clarus) on July 13, 2018 by pbmgarden. I was admiring coneflowers at my local garden center just yesterday. I was seriously tempted and had to remind myself several times what short-lived plants they are here. If I’d have thought about their attractiveness to butterflies, though, I’d probably be wondering where to plant them right now. The special fancy hybrids I’ve tried are very short-lived here, so I content myself with the “regulars.” This time of year I rarely visit the garden center because its too hot and dry to get anything established. Right now everything with wings is drawn to my catmint of which I have many. 🙂 We need rain too – like a dust bowl out there. Would we even notice and appreciate a summer of perfectly interspersed rains? I’d like to think so. My catmint hasn’t done well this summer. Glad yours is doing a good job. That’s such a fun thought! Maybe they’re wearing little protective sneakers. You’re right about the sharpness of those cones! We have lots of skippers in the yard and they often alight on the deck railing in the morning to sun themselves. They can fly super fast for a butterfly! Eliza, the skippers are quick indeed. Holding on to that thought of rain! The coneflower that we planted this year got cooked when the oddly mild weather became more seasonably warm. It did not get too warm, but it happened suddenly enough to offend the coneflower. That’s too bad. Knew there was a bad heat wave. Hard for plants to not be stressed. Yes, it had been bad, but just before planting, we had somehow missed it . . . and we still missed the serious heat. It was just the sudden change that was the problem. It certainly does! Certainly one of the top plants for attracting pollinators.